Dorothy lives in the midst of the great Kansas prairies. One day the farm house in which she lives is whisked away by a cyclone. Dorothy ‘s farmhouse lands in a strange country where she meets a a witch and some kindly but peculiar people called the munchkins. 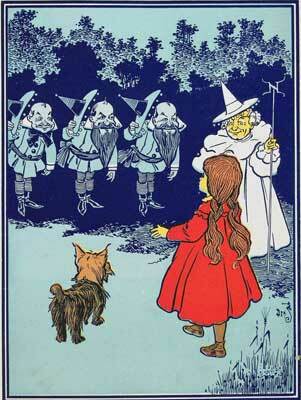 Dorothy continued along the road of yellow brick road. There was a great cornfield beyond the fence, a Scarecrow, was high on a pole to keep the birds from the ripe corn. His head was full of straw. Another character who needs the help of the Wizard of Oz? 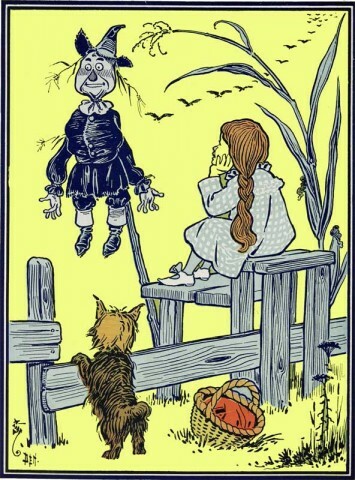 The Scarecrow tells Dorothy how it felt to hear and see for the first time. Is it better to have brains or a heart? The Scarecrow and the Tin Woodman have different views. Dorothy, the Tin Woodman, and the Scarecrow are on their way to meet the Wizard of Oz. A lion leaps out and chases the little dog Toto. He is ashamed to admit that he is a cowardly lion. Dorothy and her friends confront some terrible beasts called the Kalidahs. The scarecrow finds himself stuck up a pole once again and Dorothy and her friends find a new danger in the form of a flower. In which we meet a small but very important person. Dorothy and her friends arrive at the Emerald City – so brilliant that they have to put on green spectacles before they enter.